Buy tickets for Ay, Carmela! In the 1986 stage play, famously made into a 1990 Spanish film, Carmela and Paulino are a couple of travelling entertainers who accidentally cross a border that separates the two opposing sides of the last Spanish Civil War and end up in a town the National Army has just ‘liberated’. They’re forced to improvise a theatrical evening to celebrate the defeat of the ‘enemy’ in front of an audience of Franco’s troops as well as condemned militiamen from the International Brigade. Can they befoul the Republican flag and live with their consciences? At the Cervantes Theatre, in the English version of Sinisterra’s two-hander, Portuguese-born West End star Madalena Alberto is Carmela opposite Ivanhoe Norona. 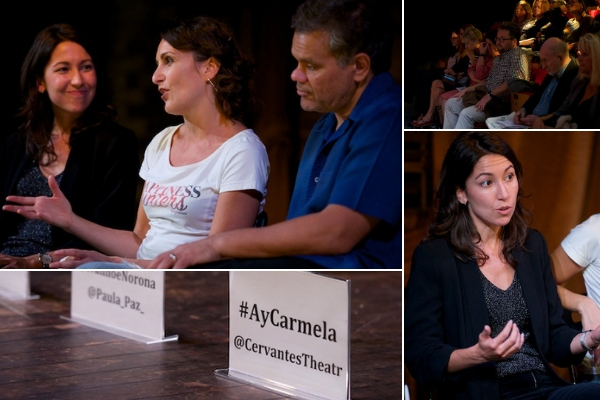 The production is directed by Paula Paz, co-founder and associate director of the Cervantes. I was joined by all three for Friday night’s post-show Q&A to discuss the play and production (a second cast, Sofia Monreal and Jorge Lucas, perform in Spanish Mondays to Wednesdays), the history of the Spanish Civil War, and the legacy of life under the dictatorship of General Franco who, after crushing the democratically elected Republican government, continue to rule Spain until his death in 1975. It was incredibly humbling to hear from the many Spanish people in the audience, who shared personal memories and stories from their own families. Watch the full discussion below. And mark your diaries now for my next post-show Q&A at the Cervantes on 9 November to artistic director Jorge de Juan‘s revival of Federico Garcia Lorca‘s classic Yerma. Ay, Carmela! continues at the Cervantes Theatre until 13 October 2018. Travelling back to the political turbulence & rising nationalism of 1930s Europe again tonight.